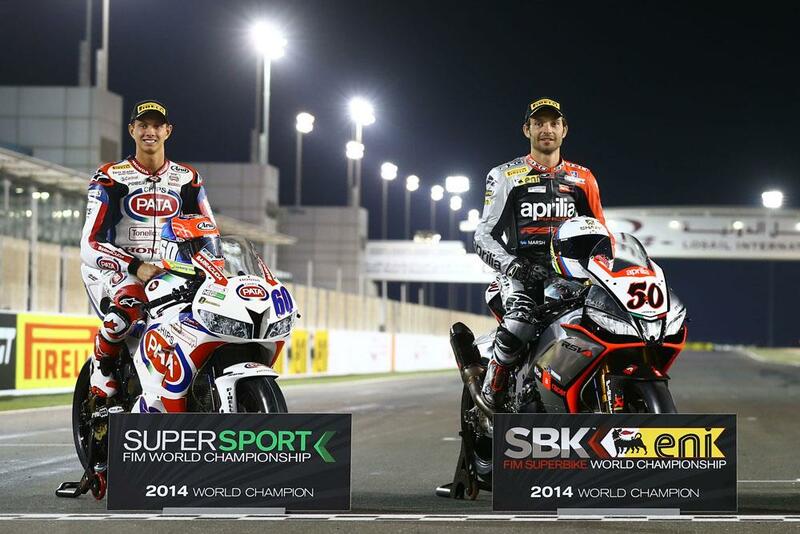 The new World Superbike champion Sylvain Guintoli will leave his world championship winning Aprilia squad, announcing instead that he will take over from Jonathan Rea at Pata Honda alongside World Supersport champion Michael Van Der Mark, for the 2015 World Superbike season. The English-based Frenchman hasn't ridden a Honda since his 250GP days, but comes with experience of working with the Italian snack manufacturer, who sponsored his Ducati that he too to seventh in the title back in 2012. The confirmation of Guintoli and Van Der Mark officially confirms the absence of Leon Haslam and Jonathan Rea at the Dutch team for 2015. Rea is set to join Tom Sykes at the official Kawasaki team, while Haslam is believed to be in talks with a number of teams in both BSB and WSB. Speaking after the announcement, Guintoli said: "The events of this season and especially last night are still buzzing in my head, but I’m delighted to be joining the Honda family and to be reuniting with Pata. The last time we worked together was a very unexpected but successful partnership. I brought Pata their first victories and we have a strong relationship. I’m looking forward to tackling this new challenge and I can’t wait to get going." "Johnny [Rea] has obviously been strong on the CBR all season, and sometimes he’s been very strong! So I think there is definitely a big potential with the bike and I think the new rules for next year will suit it. So for us this is good news and I can’t wait to understand how it works; but it looks like a really good package and I’m looking forward to getting the first impressions soon." Team boss Ronald ten Kate concluded: "In many ways it’s the end of an era, but it’s the start of a new one, too, and I think 2015 is going to be a really exciting season for us. I’m really delighted that we are able to welcome Sylvain to the Pata Honda team for his first ride with Honda. He has a great record in the World Superbike championship and has performed really well this season to come back from a big deficit and win the title yesterday in style. With Mikey [van der Mark] on the other side of the garage I believe we have that perfect blend of youth and experience that all team managers aim for. We have an intensive winter testing schedule planned and I honestly can’t wait for next season to start."